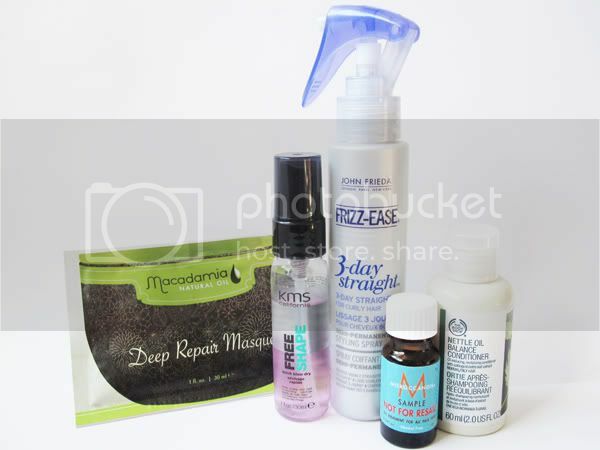 What's in my toiletries travel bag? If you follow me on Twitter, you may have seen me mention that I'm heading to Tokyo on Sunday. It's a place that I've always wanted to visit and I'm so excited to finally be able to go! I've had a few requests to do a 'what's in my travel bag?' 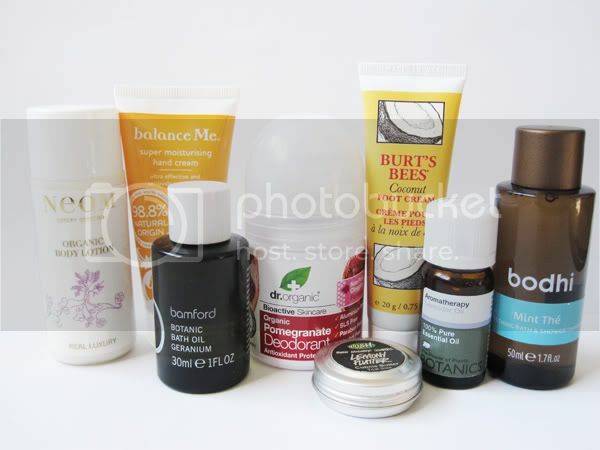 type of post detailing what beauty products I'll be taking with me, so here's my toiletries one to start things off. [Haircare]: Macadamia Deep Repair Masque - When I saw this in last month's Joliebox, I knew that I'd have to refrain from trying it out straight away, and popped into my travel bag instead. Can't wait to use this. KMS California Free Shape Quick Blow Dry Spray does what it says on the bottle and will be perfect for using in the mornings, along with John Frieda Frizz Ease 3 Day Straight for quick and easy sleek hair. I'm also taking this trusty little bottle of Morrocan Oil for last minute touch ups. I'll be decanting a little of my usual Eucerin shampoo to keep my scalp happy and will be pairing that with The Body Shop Nettle Oil Balance Conditioner, which I believe is now discontinued but was from a gift set I received at xmas. [Bodycare]: I have so many body lotion travel sizes from various beauty boxes that it was difficult to just pick one, but eventually I decided to take Neom Organic Real Luxury Body Lotion because it just smells incredible. Hands and feet will by taken care of with Balance Me Super Moisturising Hand Cream and Burts Bees Coconut Foot Creme, with a mini tin of Lush Lemony Flutter to rub into cuticles before bed and for any extra dry areas that need it. My new favourite Dr Organic Pomegranate Deodorant will also accompany my travels and keep me smelling fresh throughout the busy days of sightseeing. As I'm likely to be completely jetlagged when I arrive, I thought that the Bodhi Mint The Shower Therapy* would be absolutely perfect for waking me up with its potent mint scent, and I'm going to decant a bit of Bamford Geranium Botanic Bath Oil to take with me for a soothing bath. Just in case I have any problems sleeping, I always carry a small bottle of Lavender Oil to help me relax and send me off to the land of nod. [Skincare]: The only cleanser I am using at the moment is Liz Earle Cleanse & Polish which gives a lovely deep clean and doubles up as an amazing make-up remover too. 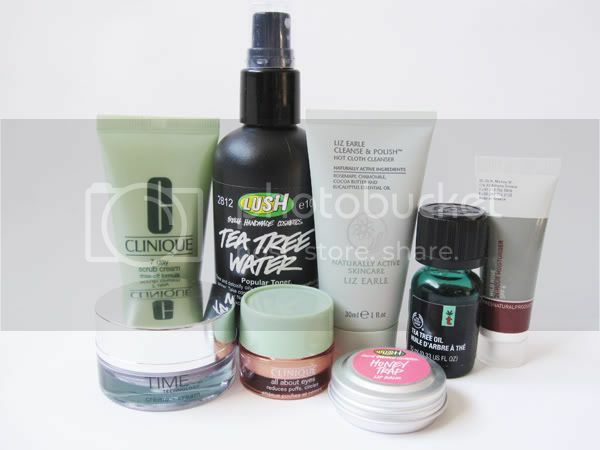 After this, I'll use my old faithful Lush Tea Tree Water to tone with, and apply a little of Clinique All About Eyes to my undereye dark circles which helps to de-puff them, as well as hydrating the eye area. For mornings, I'll follow with Korres Wild Rose 24 Hour Moisturiser which has SPF 6, and before bed, I'll use Institut Esthederm Time Technology Cream. Twice a week I'll use Clinique 7 Day Scrub Cream to get rid of any dull dead skin cells, and I have a mini bottle of Tea Tree Oil just in case any blemishes decide to show up. For lips, I'll be taking my Lush Honey Trap Lip Balm. So that's everything. I am one of those people who usually leaves everything to the last minute, but doing this blogpost has helped me strike at least one thing off my enormous to-do list, hooray! I will post a make-up one at some point this evening too.